Oh, really? That's cool! Are they showing it the whole afternoon like on the nobel.se Website? 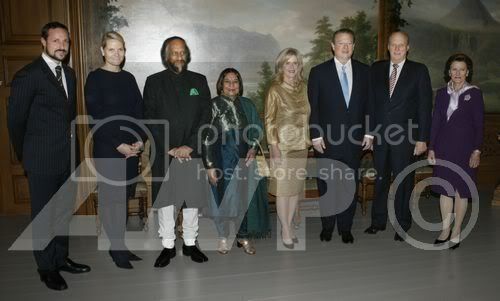 This years Nobel Peace Prize laureates, Al Gore and Rajendra Pachauri of the Intergovernmental Panel on Climate Change (IPCC) meet with Norwegian Royal Family in the Royal Palace in Oslo, 10 December 2007. 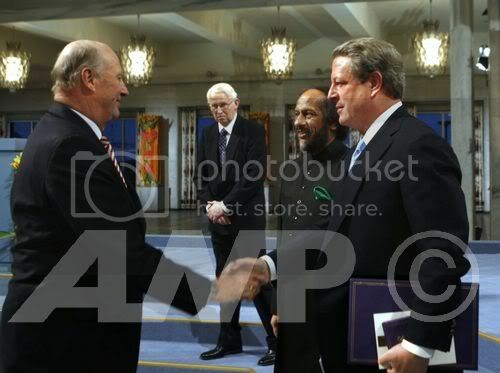 Gore and Pachauri will receive the Nobel Peace Prize for their work in helping to combat global warming. It's very interesting, I've never seen one of these live before. 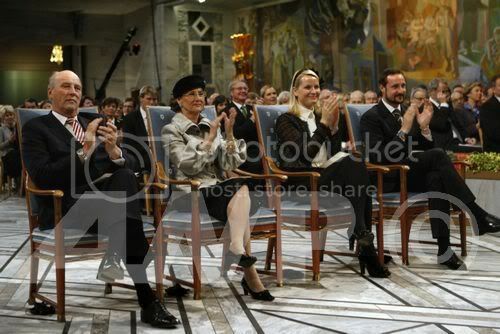 I think Mette-Marit looks really great, so do everyone else. 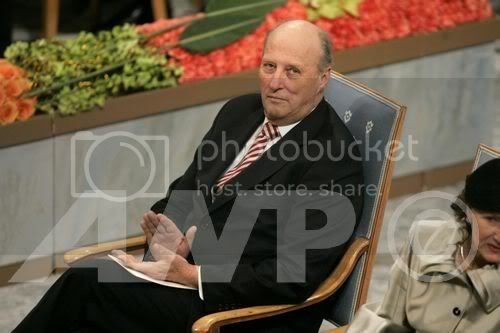 Maybe OT or obvious, but why is the Peace Prize done in Norway, but all of the others in Sweden. It is not obvious, and it is not truelly known why Alfred Nobel chose to have The Peace Prize awarded in Oslo. He stated in his will that it was to be so, but he did however, not explain why. Here are some useful homepages with more information. 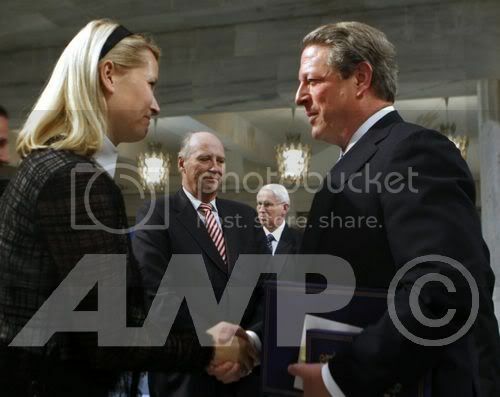 CP Mette Marit is using a very elegant black coat with a very beautiful detail in the collar. MM looked lovely, expected her to be in black today. I liked the hair piece (doesnt look new) Queen jacket was nice as well also liked her hat, made her look a few years younger. Sorry folks, but I think that Mette Marit really needs to incorporate some color into her wardrobe. The monochromatic black look just drains any color from her face. If she insists on wearing a black suit, perhaps she could coordinate it with a bright colored sweater or blouse and some "lighter" black stockings rather than the black opaques. She's an attractive woman but it's lost in all the black. I love Sonja's hat! Not sure about the blouse yet, but the hat is great! I also like Mette's outfit! okay, it is black, but it looks elegant, IMO! The cardigan looks great on her! How come they have the concert the day after the award is given out? The day the Award is given out there is a Gala in the evening the winner uses to attend. 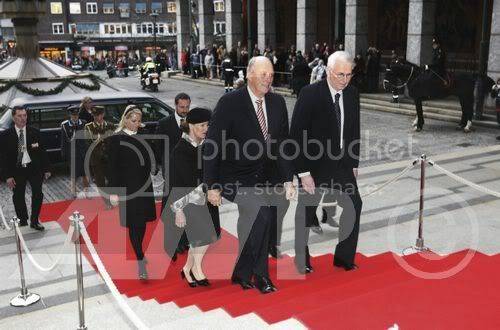 King Harald and Queen Sonja of Norway talking to Kaci Kullmann Five at the Oslo Grand Hotel befor the Nobel Banquet Monday evening. I really noticed a difference this year. Possibly I haven't paid much attention before. But in Norway the ceremony is more about the winners and it being their day. The royal family is there but they are not capturing or trying to caprture all the attention. Whereas in Sweden, it seems that people are much more focused on the royals being in their dresses and tiaras. Though it's nice to see the royals in Sweden being showy in their best stuff. I think I prefer the approach of the Norwegians. I thought everyone looked lovely and appropriate. Possibly M-M needed jewelry in the one outfit she was wearing. I actually prefer Sweden's approach (white tie and tiaras) to Norway's (casual - and I didn't even recognize the Queen with her hat, glasses and blouse!). I don't think it's about the royal families versus the winners. I love this picture so much, it's a great one of the couple! Mett-Marit looked lovely. Although I sincerely hoped she wouldn't wear black/dark colour, the Princess looked so fresh and so lovely, that I don't mind the colour of the outfit at all. Like Aurora810, I prefer the Norwegian way of 'celebrating' the winners. They are the main heroes, not the Royal Family, so I think it's appropirate to be a little dressed down, to have more focus on the people, who had deserved it with their hard work. I don't mind Swedish pomp and tiaras at all though.